LAPD Detective Peter Decker doesn’t know quite what to make of Lilah Brecht. The beautiful, eccentric spa owner and daughter of a faded Hollywood legend, Lilah was beaten, robbed, and raped in her own home—and claims to have psychic powers that enable her to see even more devastating events looming on the horizon. With his heart and mind on his pregnant young wife, Rina Lazarus, at home, Peter finds it hard to put much credence in the victim’s outrageous claims, or to become too deeply involved with her equally odd brothers and aging film star mom. 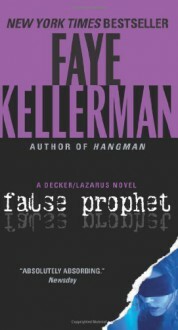 But when Lilah’s dark visions turn frighteningly real, Decker’s world will be severely rocked—as the “false prophet’s” secrets and obsessions entrap the dedicated policeman . . . and point a killer toward Decker’s own vulnerable family.